Perched in the Manali Valley of Himachal Pradesh, Mount Deo Tibba is a technical peak well known among the mountaineers all around the globe. The trekker has to reach Manali in Volvo AC Bus and the trek starts from the exquisite region of Solang Nala. The trek passes through the prehistoric village of Jagatsukh. This rustic and exquisite village allows the trekkers to explore the ancient culture of Himachal. Afterwards, this congenial trek takes the travellers to the grazing grounds of Gaddi Shepherds and Chandratal Lake. This radiant lake offers a serene and splendid panorama that simply spellbinds the travellers. The trail also offers the view of Deo Tibba Peak giving an exclusive and heart-warming trip experience to the travellers. This 16 nights and 17 days itinerary includes a comprehensive trek to Mount Deo Tibba. This long itinerary offers enough time to trekkers for acclimatization. In this amazing tour, the trekkers get ample opportunities to relish the breathtaking vistas of other imposing Himalayan Peaks as well. On arrival at the New Delhi airport, meet our representative and get transferred to your pre-booked hotel in Delhi for staying overnight. After breakfast in the morning, we will leave for half day city tour of Delhi and visiting all major. Around the evening, we will drive to Manali by an AC Volvo bus coach around 6.30pm followed by an overnight journey. On reaching Manali in the morning, meet our executive and transfer to hotel and check in. We will meet after lunch to familiarize you with the team and go through your gear. Evening time is free for shopping and visiting the local markets. Overnight stay in the hotel. Today we will leave early in the morning to take a hike up to the Patalsu peak. The trek starts from Solang Nala, which is 12 km drive away from Manali town. Our goal today is not to make the summit (at 4300m), but to go as high as possible. Once we will reach a good height, we will spend several hours relaxing there. In the evening, we will walk back down and head back to Manali. After breakfast in the morning, we will drive up via Jagatsukh village to the far end of the road constructed by the hydro-electric project at Khanool. After distributing the loads among our porters, we will start walking up to the valley to our campsite at Chikka (3500m). The meadow of Chikka is home to a temple of the Nag Devta and acts as a refuge to skiers and snow-shoe hikers in winter. Enjoy dinner followed by an overnight stay at the camp. Today, we will continue with our trail up to the valley. At the top, we will be greeted by a spectacular view of Mt. 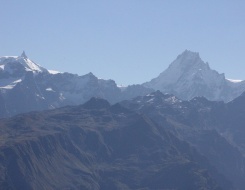 Deo Tibba (6001m). Just before lunch, we will cross the Seri campsite, once said to have been the site of an alpine lake. Now this enormous flatland is home to a varied species of alpine flowers and herbs. We will climb the further uphill to the Tenta plateau (4000m), our campsite for the night stay. Today, we will have a complete day to rest and relax. We will spend the day at the base camp and enjoy eating, drinking and sleeping and adjusting to the altitude. The tasks for the day will include technical gear distribution, crampon fitting and a general meeting on how we’ll proceed over the coming days. Just after lunch, we’ll take the short walk to the Chota Chandratal Lake and later return back to the camp for an overnight stay. Today in the morning, we will take our first committed steps up the mountain. From now on, the expedition will be run in a semi-alpine manner. Our cook and helper will remain at the base camp. The rest of the team will proceed up to the mountain and work as one – although we have a sufficient number of high-altitude porters on the team, all expedition members will be required to carry some of the common food, gear, etc. and assist with the camp activities - cooking, tent pitching, etc. Today, we will climb over the Taintu pass (previously known as Duhangan Col) and proceed to set up Camp 1. Today, we will walk over the steep terrain. For this, we will leave very early in the morning with the hope to set up the camp before lunch. We’ll have dinner early in the evening and head straight to bed for some rest before the next day’s summit attempt. We’ll leave camp in the middle of the night in order to take advantage of the hard snow. If all goes well, we’ll arrive at the summit early in the morning. After a good photo session, we’ll head back down to Camp 2. Following a refreshing drink and snack, we’ll break camp and head back to Camp 1 for the night. If time permits, we can descend all the way to base camp. The day is reserved for Summit. In case of bad weather on the previous day, we’ll use this day to attempt the summit. Today, we will descend to the Base Camp after summit. Overnight stay at the base camp. Use all of today to rest, sleep and recover from the exertions of the past week. We’re back at base camp, so we’ll have the luxury of our base camp cook, who’ll cook up some amazing feasts to make us feel really good. Today early in the morning, we’ll break camp, prepare the loads for the porters/mules and make our way back to Manali. It’ll be a long walk back down! You’ll be dropped at your hotel/guest house for a well deserved shower. At night, we’ll regroup for a customary post-expedition party. Overnight stay at the hotel/guest house. In the morning after breakfast, we will leave to explore all the surroundings and then drive to New Delhi in the evening by AC Volvo bus which is an overnight journey. On arrival in New Delhi in the morning, our representative will relocate you to the already booked hotel. Later in the evening, he will transfer you to the international airport to catch the flight for onward destination. End of tour and services.